if you wanna get the rear to hook up more try running a higher roll center in the rear ( lower hole on the shock tower ) also maybe go back to the starsdard hex that usually helps with grip. Can we see what setup sheet you’re running for it ? this might sound crazy. Just lower the rear camer camber link on the tower. Also change your rear camber to 1 degree. If that does not help I would look at your engine. That is a lot of motor for a buggy. To calm that down you may need to raise your center diff fluid. I will drop the rear camber link down as stated. The motor is already restricted down to 6mm, and has the pipe to smooth it out. The stock Xray clutch engages early and very smooth, but gets full lock right before the power band. This motor combo does create huge power, but only hits once you are already moving, as the RED's X-one 2104 really smooths it out. Its so close, I think the rear roll center change should be right on. Diffs from 6-7-3 to 6-6-3. I will consider a +2 rear wheel hub increase, but not sure that will be needed with other changes. This is my race car so it will be rare that I run on anything other than new tires, I should be able to use that power. I don't want it so locked down in the back end that it doesn't rotate freely in the corners, its just taking the edge off the exit that will make it literally perfect. I don't want people to think this car isn't working properly, it is, in fact I've never been so excited to race a buggy, its that good. This 2019 Xray in PBS, or C-hub, is truly a brilliant piece of work right out of the box. I mean a sway bar, aluminum steering servo arm, and some +2 wheel hubs,... thats it, nothing else needed. The locals up here have no idea what I'm about to do to this track on race day! lol! Ran it for about quart, was really liking it, got a little too bold off a jump with a really bad lip, landed front down cartwheel style and broke a front arm, (50 deg OSA). Slapped a new arm back on, got back out, but it started raining. So, test not concluded, but 6K 6K 3K felt good in the diffs, consistency was up, less guessing. Felt better out of the corners, now possibly too hooked up mid corner, I will run again before making any further changes. I did also setup a little negative "CURV/EXP" for the steering in my radio (Sanwa M17), that felt better too. I've pre-built a Center Diff @ 5K, and front diff @ 7K, to quickly swap out a couple combos next session, will post back. Not sure on raising the roll center just yet, need another run. The track conditions might change next outing with some moister coming up from the track after a rain, so we will see. I never did put the +2 wheel hubs on the back, think that might lock the back in too much to be fast in the corners. About the arm... If the arm didn't break during that wreck, I would have had other damage, probably bent pins. Now that I can see inside the plastic of the arms that come with the kit, its obvious they have a lot of glass in them. So yes, brittle is the word, and colder temps definitely not helping. Anyone know when or where to get the softer front arms? I'd like to hold onto these XH ones for the heat of summer. 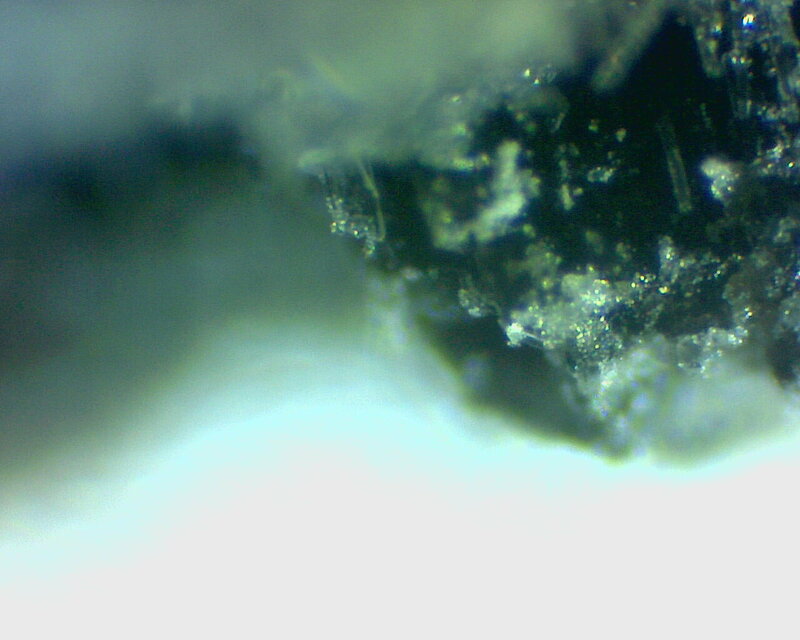 I tossed the broken arm under a high power microscope real quick so you guys could see what I was saying about "glass content" in the front arm plastics from the kit. I don't like to just "say" things without a bit of proof, and on the flip side we will all probably be scavenge for these hard arms when its 100 deg this summer! lol. We weighed both nitro and e buggies last night. E-buggy with 2x 2s short packs was lighter than the nitro car with fuel in it. E buggy was 6.74 and nitro car was 6.83. So,.. second front arm down. Changing the C-hub car back to PBS. C-hub car felt faster with last changes made, but one small mistake cracked the second arm. No big deal, will try again this spring/summer, or when I can get some medium or softer compound front arms. If you know a spot to get a set let me know. After the C-hub breakage I slapped the PBS buggy down again, went 9 minutes straight without a marshal. The last setup I posted for the PBS buggy is near perfect for big track club racing. I'll probably test a few small changes, sway bars, etc.. will post improvements as I confirm. Best tires tested so far are,... Sweeps Brand/whips in silver compound, and AKA Grid Iron 2's soft long wear, both work well for medium/loose traction on the PBS car. Completely stock in c hub configuration. Are you guys weighing the buggy without tires and dry? Or track weight with tires and full tank? Tires alone can have drastically different weights. Batteries out without tires, or batteries in with tires, I assume batteries could have quite an impact on weight also,.. no? Full tank without tires would be the best measurement for nitro, and batteries in without tires would be the equivalent, I would think anyway. However, pipes and cooling heads would also change the weight quite a bit on the nitro. I'm running the light weight 1600mah lipo receiver pack, FX motor with the Low-Pro drilled out head, super light REDs X-one 2104 pipe, and Ti turnbuckles. This combo feels light on the track, but I will weigh it to see. weight was taken without tires, full tank of fuel with rx battery installed. E car was with 2 6000 shorty packs installed. No bodies on the car either. Nitro car has tessman 2101 engine in it right now. We have an fx k302 ready to go in that appears to weigh 15g lighter than our current combo. No titanium on the cars. Only reason both cars might be wrong if the scale we used at the hobby shop is off. Our e car is lighter than the nitro car. We also found the nitro car has more rear weight bias that affects how we have to set up the rear. The nitro car has more rear traction. Anyone have pics or more info on the new xray 4 shoe clutch? It’s available on rcamerica but no pic or description. I heard it has a 3 bearing clutch bell. raising your center diff fluid would make it worse. I lowered it down to 6K in the center, helped calm everything down on a loose track. 6-6-3 now, feels really good, very consistent. Not from our experience. It does two things. It reduces the rear rotation and it takes the torque out of an engine or an electric motor. Raise it far enough on a nitro engine and you will hear the engine begin to strain like a lean bog. All times are GMT -7. It is currently 03:32 AM.